Shrewsbury – Maureen Sullivan died early Thursday morning, June 26, 2014, after a long battle with cancer. She was at home, surrounded by loving family and friends. Maureen is survived by her beloved husband, Brian Sullivan; her devoted daughter, Amy Sullivan; and her loving sister, Roberta Riordan of Milord, Conn. 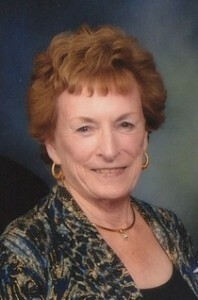 The daughter of Robert and Margaret Toohill, Maureen was born May 30, 1938, in Worcester. She was working at State Mutual Insurance when she met and married her loving husband Sept. 30, 1967. From there she settled into Westborough, and was an active and caring mother to her daughter and late son Brian Scott. Maureen was an active participant of the Westborough community and a member of Westborough Women&apos;s Club, St. Luke&apos;s Women&apos;s Club, and Westborough Garden Club.? Of all the activities, she pursued none she felt more passionately about than her role as a Eucharistic Minister at St. Luke the Evangelist Church in Westborough. Maureen had a strong relationship with God and depth of faith that helped her through her eight-year journey with cancer. Maureen was currently living at the Adam&apos;s Farm Community in Shrewsbury. Like in Westborough, she was a presence in this community, and formed strong and lasting relationships. These friendships gave her much joy and comfort during her time at Adam&apos;s Farm. Maureen was well thought of from everyone who knew her, as apparent by the massive level of support shown to her throughout her life and this journey. She was a loving and caring woman of faith who routinely put others needs before her own. Maureen will be missed by those blessed enough to have had her in their lives. Please join in celebrating her life Monday, June 30, at 12 p.m., in St. Luke the Evangelist Church, 70 West Main St., Westborough. Donations in her memory may be made to St. Luke the Evangelist Church Memorial Fund, 70 West Main St., Westborough, MA 01581.